Reports coming out from the Puruni Landing in Region 7, Essequibo (Guyana, South America), late yesterday, have revealed that two Police ranks who were in the process of raiding a mining camp some 20 minutes up the Puruni River from the Landing, shot and killed a 37-year-old undocumented Brazilian miner named Estevao Costa Marques, after he ran as the ranks were carrying out the raid. A witness to the tragic episode claimed that he was not too far from where the incident occurred. The man told this publication through a translator, that the police would normally come and raid the camps – looking to take money from undocumented Brazilian miners in the area. Around 13:00 hrs yesterday one such raid was being carried out by the two police ranks. As they approached the camp owned by the victim’s mother, a Brazilian miner known as Maria de Nazaré Costa Marques, the man made a run for the bushes. The witness claims that “the police just point his gun and fired two shots”, with one hitting the young Marques in his back and the other hitting him at the back of his head. The witness opined that the man fell dead instantly, as “his head exploded”. The witness said after the police shot the man, they clearly began to panic. “They were attempting to dispose of the body; at one time they even tried to burn the body, but other miners started to create a scene. They (police) were telling the people to clear the area, but all the miners in the area came out and kept a watchful eye on them. 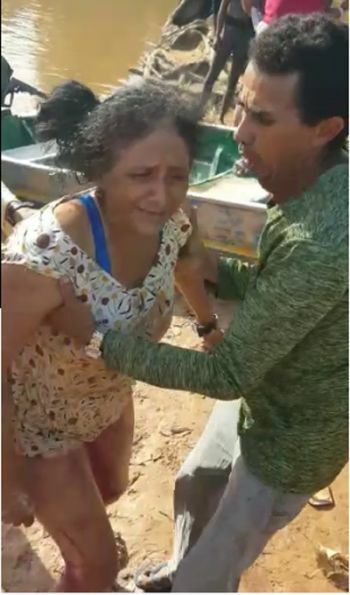 This didn’t sit well with the mother who was still reeling from shock, and this was evident in a video that was seen by this publication, of the scene at the Puruni Landing, where the two cops could be seen in the boat with the body while the mother went in and out of consciousness as she mourned her son’s demise. The witness said the police and the boat captain left for Bartica. 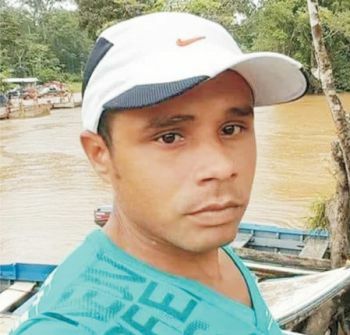 The victim’s mother and stepfather, Elvide Pereira De Barros, made an attempt to follow the police boat, but were unable because of the superior horsepower of the law enforcement vessel. Witnesses claim the police dumped the body on a beach on their way to Bartica. Up to press time, attempts were still being made to recover the body. Family members at Puruni Landing confirmed that they had not recovered the body and neither the police nor the body could be found at Bartica.